DOMESTIC GODDESSES: Indian comfort food! So I said that dahl (lentils) and rice was all I’ve been eating lately cause of my dodgy tummy, and that it wasn’t really blog worthy. Well, I have changed my mind. Mild lentil curries served with soft steamed rice must be my ultimate comfort food. I have eaten this combination in various forms for the last six days and am not sick of it yet. A friend came to visit me yesterday, so I decided not to deviate from my theme however just to make a slightly more sophisticated version. As I made this curry I was keeping one of my favourite dishes at Kebab Mahal in mind and even if it’s not quite the same, it was damned delicious and as with most curries tasted even better today. Use it as a side dish to a meaty curry or as the main event if you’re a vego or just enjoying a meat free meal. It is such a satisfying meal. In a medium pot fry the onion, garlic and ginger until soft and golden. Add the butter and spices and fry for a minute. Add the tomato paste, lemon zest and cream and simmer while stirring for minute. Add the lentils and simmer till warmed through. Switch off the heat and add the youghurt. 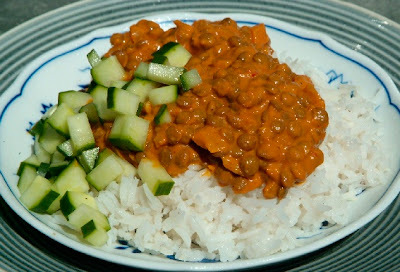 Serve with basmati rice, roti and sambals.